Grate the unsweetened chocolate into a bowl and cover it with a little of the boiling water. Mash the mixture into a paste. Add the rest of the water and vanilla and beat with an electric mixer until frothy. Add the pepper and chilies to liven up the drink. The chocolate will not totally dissolve and will have a grittiness to it. For a more authentic drink let the mixture cool and then beat until frothy and drink. Follow the directions for the Aztec Chocolate omitting the pepper and chilies and add 3 teaspoons of sugar, plus a dash of cinnamon. Combine the ingredients in a saucepan and heat gently stirring. Do not boil. Mix with a whisk and then pour into mugs. Sprinkle additional cinnamon over the top and add sugar to taste. Recipe by: Spoonbread & Strawberry Wine - ISBN 0-385-47270-6 In a large saucepan combine the chocolate and sugar with the hot water. Bring to a boil, stirring for 2 mins. Add milk, and continue heating. When hot, beat in vanilla with a rotary egg beater or whisk. Remove from heat. Chill, then pour into a punch bowl over ice cream. For sparkle, add club soda. Top with whipped cream and dust with cinnamon. Yield: 12 servings. In a bowl with an electric mixer, beat cream with sugar until it just holds stiff peaks. Chop chocolate and reserve 2 teaspoons. In a small saucepan, heat milk with remaining chocolate over moderate heat, stirring, until it just comes to a simmer. Pour hot chocolate into 2 large mugs and top with whipped cream and reserved chocolate. Serves 2. Serves 8 to 12. Recipe and halves and doubles easily. From the court of the Bentivoglio family in Bologna during the 1600's comes this recipe for hot chocolate. Their cook, Giuseppe Lamma, was responding to the fashion of the day in writing a recipe for processing the cocoa bean along with his own rendition of the drink, chocolate (the candy was still far off). 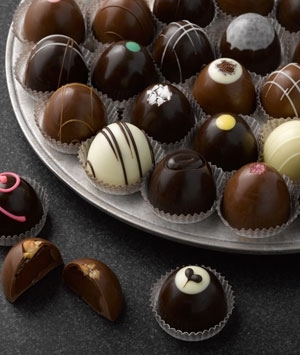 Some historians claim Italians taught the art of chocolate making to the French and English in the 1700's. Another logical explanation is all the Spanish connections with those countries through diplomacy, noble marriages and alliances. After all, it was the Spanish who brought chocolate to Europe from the America's, and they adopted chocolate drinking with great enthusiasm. Do try this recipe as written, then you might want to substitute milk for the water. Serve as a dessert in small cups, or chill and spoon up as a cream. Combine all ingredients except chocolate and extract in a 4 quart pot. Bring to a simmer, cover, and cook 5 minutes. Turn off heat, leave covered, and let steep 15 to 20 minutes. Strain into an 8-quart pot. Set over medium heat, adding the chocolate. Whisk until just below the boil, tasting for extra vanilla. Then froth by whisking vigorously. Ladle into small cups and serve hot. Mix all the ingredients together in a very large container. Use a wire whisk to be sure it is distributed evenly. Divide mixture into jars with tight lids. To make hot cocoa, place 2 - 3 tablespoons of mix into a mug. Add boiling water and stir well. You may use more or less mix to taste or depending on the size of the mug. Put the coffee, milk, chocolate syrup, and vanilla extract in the blender. Blend well. Add the ice cubes and the ice cream. Blend until the mixture is smooth. Pour into 4 tall glasses. Add whipped cream and cinnamon sticks. Beat the egg yolks until thick and creamy. Stir in the condensed milk, cream, chocolate topping, coconut essence and whisky. Mix thoroughly and bottle. Store up to 3 weeks in the refrigerator. This hot chocolate is wonderful and wonderfully easy to make. Heat milk and chocolate over medium high heat, stirring frequently to mix chocolate as it melts. If you're using the vanilla bean, split it open and scrape seeds into milk, add pod and proceed with heating milk and chocolate (remove bean pod before blending and serving). When milk is very hot and all chocolate is melted, add liqueur (if desired) and put mixture in a blender and puree, or whisk by hand to mix well. Pour into cups, top with whipped cream and serve. Note: Mexican Sweet Chocolate can be found in the Latin Foods section of your grocery store, or in Latin Food Markets. This chocolate is high in sugar and flavored with cinnamon and sometimes almonds. Ibarra and Abuelita are two popular brands. Combine all ingredients in heavy medium saucepan. Stir over low heat until chocolate melts. Increase heat and bring just to boil, stirring often. Remove from heat and whisk until frothy. Return to heat and bring just to a boil again. Repeat heating and whisking once again. Discard orange peel. (Can be prepared 2 hours ahead. Let stand at room temperature. Before serving, bring just to boil, remove from heat and whisk until frothy.) Pour hot chocolate into mugs. 2 Servings. In a saucepan or in the microwave, heat the milk through. (Skim off the top with a spoon if necessary.) Stir in chocolate syrup. Stir in peanut butter until melted. Garnish with whipped cream topping and chocolate sprinkles.